This beautiful and brilliant engagement mounting is part of the Ritani Masterwork collection. 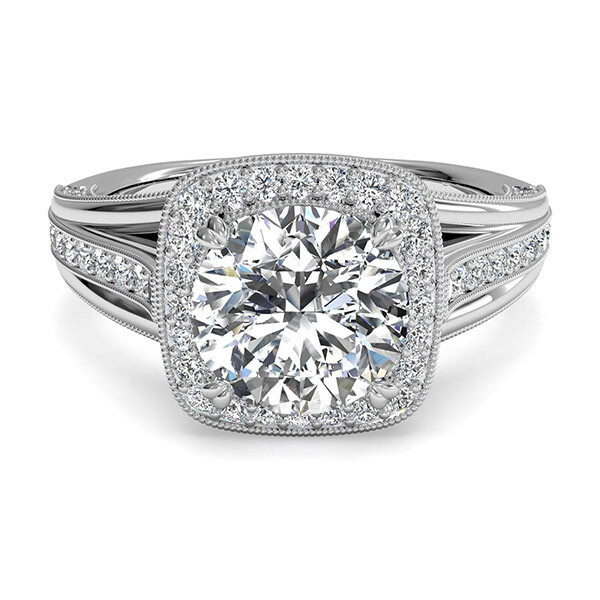 Crafted in 18kt white gold, a cushion-shaped halo will surround your round center diamond. The gems are vaulted by a pave diamond band that is embellished with detailed milgrain edging. Pave diamonds are a feature of the sides and under the setting. Any way you look at this setting you will see sparkle and shine! You may also choose from a variety of precious metal finishes, including 18kt yellow gold, rose gold and platinum.This diamond engagement mounting from Ritani is full of pretty particulars!